We often get asked how we decide on the themes for the tailgates. Most of the time a magazine, cookbook or TV show sparks discussion about potential themes. During the summer we debate and discuss the options, refine the ideas, scrap ideas, and often what we end up at the end of the summer is vastly different than what our initial thoughts were. 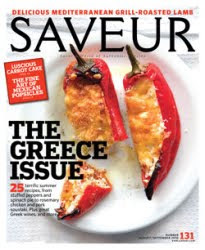 For example, our first tailgate of the season started when we spied Savuer magazine (http://www.saveur.com/in_this_issue.jsp?issueId=201006) issue #131 which was ‘The Greece Issue’. Who couldn’t be inspired by the images? And that’s where the discussion started and menu planning was discussed for weeks. Initially there was talk of grilled lamb, souvlaki, and/or lemon chicken. A few weeks later when out to brunch one of the specials of the day was a greek meatball grinder and the menu took an unexpected turn. While meat on a stick (such as souvlaki) is always a hit, a meatball pita is something new to our tailgate and allows for a very mobile meal. We made two kinds of meatballs, one a more greek-traditional meatball and a second that had spinach, feta, and olives mixed in. The sauce for the meatballs was a home made tzatziki and of course, more feta. With the ‘main’ dish now decided, it was time to turn our attention to the side dishes and desserts. Olives were a must and a white bean salad with artichokes, olives, and roasted peppers rounded out some of the sides. For dessert we debated the choices and had initially settled on buying some baklava (who would make that from scratch? ), but decided that a homemade pistachio brittle would incorporate the flavors, but add a twist to the traditional. Rounding out desert were lemon cupcakes with a greek yogurt frosting that was to die for! And that’s how My Big Fat Greek Tailgate was put together. Are you inspired yet?